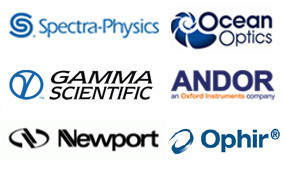 Ocean Optics offers a number of spectrometers and spectrometer systems — tools particularly suited for the teaching lab or your educational application. 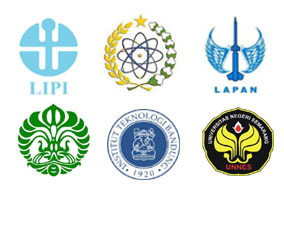 Our CHEM4-series Spectrophotometers for education are small-footprint, PC-based systems designed for chemistry professors, teachers and others who use spectroscopy as a teaching tool. These fully integrated systems — including spectrometer, light source, cuvette holder — are available at dramatic discounts. Acquire and display data — 3648 wavelengths — in <1 second with our convenient PC-based systems. Each CHEM4 system comes with a fully integrated light source and cuvette holder that attaches to the spectrometer for a remarkably small-footprint system. The cuvette holders for all CHEMUSB4 systems are designed for standard 1-cm square cuvettes. The CHEMUSB4-UV-VIS has a state-of-the-art, miniature RF-excited deuterium tungsten source. The CHEMUSB4-VIS has a direct-attach combination tungsten and blue LED source. You can separate each spectrometer from its integrated light source to couple the spectrometer to any of our fiber optic accessories and light sources. The CHEM4-UV-FIBER and CHEM4-VIS-FIBER include a light source and cuvette assembly that attaches to the spectrometer with an optical fiber. The advantage of this design is that the light source can be easily coupled to other fiber optic accessories such as reflection probes or transmission dip probes. The CHEM4-VIS-FIBER comes with a tungsten source and the CHEM4-UV-FIBER uses a deuterium tungsten source. All of our CHEM4 systems interface to a PC via USB. All you need is to install the software and connect the included USB cable to your PC to be up and running. Wavelength calibration data are loaded automatically upon startup, and spectrometer power is supplied through the USB. To get the most of your CHEM4 system, you can add our optional student-friendly software, which includes functions for absorbance, transmission, relative irradiance and kinetics measurements. The systems also work with our SpectraSuite Spectroscopy Software, which works in Linux, Macintosh and Windows operating systems. The CHEMUSB4-UV-VIS is the perfect marriage of our USB-interface spectrometer technology and modular accessories. The system consists of a USB4000 Spectrometer with a combination deuterium tungsten halogen light source and 1-cm cuvette holder and high-speed electronics and operating software. The CHEMUSB4-VIS-NIR packages a high-tech built-in light source, a USB4000 Spectrometer, a holder for 1-cm cuvettes, and high-speed electronics into a small-footprint system. Used with its associated software, the CHEMUSB4-VIS-NIR provides real-time, PC-based spectroscopy and captures full spectra from in only 25 milliseconds using 3648 data points. Light source and sample holder: USB-ISS-VIS integrated tungsten bulb with violet LEDs and cuvette holder for 1-cm square cuvettes. The CHEM4-UV-FIBER covers the 200-885 nm range, has optical resolution of 1.0 nm (FWHM) and captures 3648 wavelengths in <1 second. The system is ideal for relative irradiance and emission measurements. The CHEM4-UV-FIBER combines a USB4000 Spectrometer with modular accessories including an ISS-UV-VIS Integrated Sampling System, a 300 µm solarization-resistant optical fiber and a 1-cm cuvette holder for absorbance measurements. The advantage of an optical fiber based system is flexibility. Add accessories including reflectance probes and dip probes for even more measurement options. The CHEM4-VIS-FIBER has an optical resolution of 1.0 nm (FWHM) and captures 3648 wavelengths in <1 second. The CHEM4-VIS-FIBER combines a USB4000 Spectrometer with modular accessories including an ISS-2 Integrated Sampling System, a 400 µm optical fiber and a 1-cm cuvette holder for absorbance measurements. The CHEM4-VIS-FIBER can also be used to make relative irradiance and emission measurements. Add accessories including reflectance probes and dip probes for even more measurement options. The Red Tide Spectrometer is a low-cost, small- footprint lab spectrometer that’s ideal as a general-purpose instrument for your budget-conscious classroom or teaching lab. The Red Tide has a wavelength range of 350-1000 nm, and utilizes a detector with 650 active pixels; that’s 650 data points in one full spectrum, or one data point per nanometer. Configured with a 25 µm entrance slit, the Red Tide offers ~2.0 nm optical resolution (FWHM). The Red Tide is a preconfigured, off-the-shelf spectrometer where all of the optical bench options, such as grating and entrance slit size, are already selected. 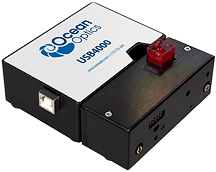 The Red Tide can be used with various Ocean Optics spectrometer accessories, light sources and sampling optics, to create application-specific systems for various absorbance, reflection and emission applications. With its small footprint (89.1 mm x 63.3 mm), convenient USB interface, and integration times as fast as 3 milliseconds, the Red Tide is a great tool for basic lab measurements. 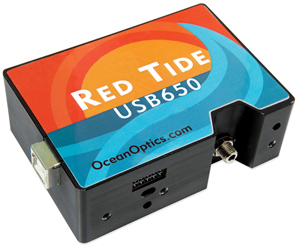 The USB-650 Red Tide comes without a light source or sample system, allowing you the freedom to choose the accessories that best fit your application. The USB-650-VIS-NIR (at right) comes with a direct-attach light source and sample holder. The light source includes an LED-boosted tungsten source and a sample holder for 1-cm cuvettes that connects to the front of the spectrometer. In this configuration, the system has a wavelength range of 370-980 nm. Note: The Red Tide USB650 is not recommended for absolute irradiance measurements. For absolute irradiance, we recommend the USB2000+ miniature spectrometer. Red Tide operates via SpectraSuite Spectroscopy Operating Software, the first spectroscopy software to run in Macintosh, Linux and Windows. The Chemistry module for SpectraSuite includes features specifically designed for educational use, such as a Beer’s Law calculator for absorbance experiments. The Red Tide also works with our educational distributors’ software. Meet the first modular, OS-independent spectroscopy software platform, exclusively from the inventors of the world’s first miniature spectrometer. SpectraSuite is a modular, Java-based spectroscopy software platform that operates on Windows, Mac OS and Linux operating systems. 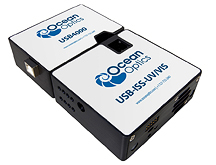 The software can control virtually any Ocean Optics USB spectrometer and device with ease. The SpectraSuite interface looks and feels the same on all operating systems yet retains the familiar appearance of an application native to each OS. 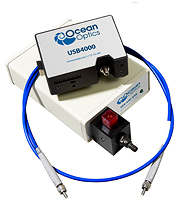 Ocean Optics is the first to offer such a flexible, feature-packed application with this level of cross-platform capability. NOTE: SpectraSuite for Mac OS X 10.6 (Snow Leopard) and Windows 64-bit operating systems is currently in beta. To get more information, please contact an Ocean Optics technical support representative. SpectraSuite easily manages multiple USB spectrometers – each with different acquisition parameters – in multiple windows, and provides graphical and numeric representation of spectra from each spectrometer. Using SpectraSuite, you can combine data from multiple sources for applications that include upwelling/downwelling measurements, dual-beam referencing and process monitoring. The SpectraSuite framework is modular. Among the modules that have been released to date are the core files, Absolute Irradiance, and Strip Charts. You or your Ocean Optics application developer can customize SpectraSuite through Java code. SpectraSuite provides the user with advanced control of episodic data capture attributes. For instance, a user can acquire data for a fixed number of scans or for a specific interval. Initiation of each scan can be externally triggered or event-driven. Captured data is quickly stored into system memory at speeds as fast as 1 scan per millisecond, with speeds limited by hardware performance.